PLEASE ALSO ORGANIZE AN EVENT FOR KEEP SPACE FOR PEACE WEEK, OCT. 1 – 8. As you will see in the listing of 20 events so far organized (Attachment D), some activities are being held somewhat past Oct. 8. From Monday, July 25 to Thursday, July 28 we had a very positive public response to our Anti-War Truth Display featuring three drone replicas, death masks of drone victims and a painted memorial to children killed by drones spread out on one of the busiest streets in downtown Philadelphia, in front of the Arch Street United Methodist Church, a church noted for its social services and political action on behalf of justice and peace. This thanks to arrangements made by Bob Smith, director of Brandywine Peace Community, the Rev. Robin Hynicka, pastor of the church and Frank Jones, the building manager who helped us pack our displays away every day in the church and bring them out the next morning. Here are the two flyers that we handed out. Here is press coverage that includes mention of our display. On Wednesday afternoon, we held an anti-war speak-out, organized by Samantha Goldman, of World Can’t Wait, that attracted at least 100 people. I was extremely impressed that the majority of those attending were in their 20s and 30s. Given the fact that the Democratic convention attracted thousands of Bernie Sanders supporters, it might seem ridiculous to be excited that 100 people turned out to talk and hear about U.S. wars, and that most were younger than 40, but given the low level of anti-war awareness and activity in the U.S. today, as noted in this article, particularly among younger people, we were very heartened. We got a chance to talk with some Bernie Sanders supporters, and I found hope that many of them intend to keep working for basic economic changes underwriting the Sanders agenda by shifting their support to Jill Stein, who also has a strong anti-war/anti-drone war position. If they Green Pary horse gets shot out from under them, I think they will develop another vehicle for change. I told a woman in her 20s, who came to the convention from California to work for Sanders, that we created our display because we felt in principle that we had to bring forward the anti-war message given the silence on war in the Democratic Party, and she said: “Democrats don’t like to talk about unpleasant things.” It was very clear that many Sanders people were comfortable being skunks at the DNC lawn party and going forward. Our display was across the street from a large plaza near City Hall, and in the messages of pro-Bernie speakers, white and black, blasting through the loudspeakers, that there was an understanding of the spiritual, intellectual and economic connections between people being oppressed by the U.S. government overseas and those who are living in impoverished, essentially colonized communities in the U.S., communities in which police abuse and killing are common-place and essential elements of repression. Gleaming glass skyscrapers rise in downtown Philadelphia like spires of the Emerald City. But, Philadelphia is one the poorest major U.S. cities; Bob Smith said that it is essentially bankrupt. http://www.cbsnews.com/media/americas-11-poorest-cities/10/ We drove through the Fishtown neighborhood, marked by desolate vacant lots, abandoned factories, and bleak tenements and streets. You find the same in parts of Germantown, and Bob said that the worst poverty is in Kensington. No politician at the convention spoke of the rawness of this kind of poverty. I believe that these places and others like them will blow sooner or later, and that this is likely to set off a chain reaction. I think there is very little likelihood that any current political party will move agressively to remedy the suffering of America’s Fishtowns and Kensingtons, but I also had the feeling that the people in their 20s and 30s, black and white, whom I met and heard speaking will correct these gross inequities. An anonymous donor has contributed a $10,000 matching grant to underwrite the continuation of the counter-drone war TV advertising campaign that was launched in 2015 by Knowdrones.com and Veterans for Peace. Here is a link to the new ad in the campaign, created under the guidance of Cres Vellucci, of Veterans for Peace Chapter 87, in Sacramento. The ad will be broadcast on cable TV channels in communities near the largest U.S. drone bases inside the United States. Please be a part of this effort to keep bringing the counter-drone war argument to drone operators and their families and to get drone war onto the U.S. national political agenda. Please help us fight the silence. 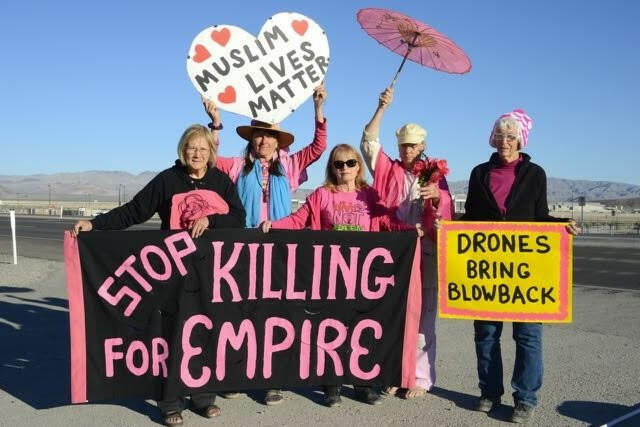 The series of drone war protest arrests at Beale AFB outside Sacramento, CA continued in June. Here is a report from Toby Blome, who says that so far the US attorneys have not moved forward with prosecution of the seven people arrested then. On June 28 seven northern California peace activists crossed the military base boundary line, one after the other, in an extended interruption of "business as usual" at Beale Air Force Base near Marysville, Calif., to continue their monthly resistance to the illegal U.S. targeted killing policies. Just prior to the arrests, activists had hung a yellow Crime Scene tape across the roadway leading into the base. The Global Hawk surveillance drone is actively involved in the drone assassination program, used as a tool to identify and track potential targets. Arrestees include: Chris Nelson (Chico), Mauro Oliveira (Montgomery Creek), Shirley Osgood (Grass Valley), Chris Knudson (Paso Robles), Flora Rogers (Marysville), Michael Kerr (Bay Pt.) and Toby Blomé (El Cerrito). As each activist prepared to cross the line, they read aloud to the military nearby parts of the story of the poor taxi driver, Muhammad Azam, who, on May 21, was unknowingly transporting a high level U.S. drone target, Taliban leader Mullah Akhtar Mansoor. U.S. officials had no qualms about sacrificing the life of this poor taxi driver for a target they were determined to murder. Sadly, both the Taliban leader and Mr. Azam, the taxi driver (sole supporter of his 4 young children, his wife and his disabled brother) were burned beyond recognition by a Hellfire missile. As our sign reads: Who will feed his family? Azam's story was not covered by U.S. media. Activists were handcuffed and loaded onto a military bus and taken to the "processing building" on base property. As activists were asked to step off the bus, Chris Nelson, one of the arrestees, overheard the military police mention that they were going to keep another arrestee, Toby Blomé, on the bus. Receiving no explanation as to why Toby was being isolated, Chris refused to cooperate, and went "limp" to protest the unequal treatment. One female MP grabbed Chris by the arm and tried to forcibly bring her to her feet, and in the process caused a small back injury which is slowly getting better. Later, a male MP, while holding a taser in his hand, threatened to use it on Chris if she didn't cooperate and get on her feet. Chris admonished him, emphasizing that elders should be treated with the greatest of respect (Chris turned 69 the day before), and reminding him of the risks imposed by taser use. Chris was persistent, and ultimately, after a "medical assessment" by a base nurse, we were informed that Toby could leave the bus before Chris. In a typical manipulative manner they did isolate Toby after she stepped off the bus, keeping her in a shaded area outside, without rhyme or reason. After some time she was reunited with the group in the processing room. Chris was ridiculously penalized with an additional charge of "assaulting, resisting, or impeding...an officer." No explanation was ever given as to why Toby was isolated, but we can only surmise that it might have to do with the vigil in the afternoon before, at the Doolittle Gate. Toby was harassed while trying to pass out fliers educating folks coming out of the base about the recent taxi driver drone victim. Daniel Dockter, the man in charge of the security personnel on the base, and with whom we have had many engagements with over the years, was ordering Toby to stand in the painted road divider ("gore") in the area closest to the highway and blocking the vision of the drivers trying to exit the base into fast moving traffic. Mr. Dockter claimed that this was the only area of the "gore" that is off base property, even though we have stood in many other areas of the gore over the last 6 years without harassment much of the time. We have also been given varying explanations about where the unmarked base boundary line is over these years. This time, security was putting drivers on the highway, drivers exiting the base and Toby all in a very unsafe situation. This seemed to be a clear effort to intimidate us, impede our free speech rights and totally ignore all reasonable safety concerns, since standing in the gore is our only reasonable place to be to access the military for leafletting. This is also in total conflict of what military personnel have emphasized over the years: that they are looking out for our "safety," or that they just want us to be safe. Toby addressed her serious concerns with Mr. Dockter and told him that he ultimately would be responsible if anyone was harmed by his orders. Surprisingly, even with a preponderance of military police present in and near the gore that afternoon, Toby was able to distribute 7 or 8 fliers. Another activist, Michael Kerr, was briefly detained, handcuffed, and cited during the Monday incident at the Doolittle gate, while he was merely peacefully crossing back and forth at the intersection with with his "Muslim Lives Matter" sign. This was his effort to be a witness and support Toby during the harassment. In addition, at the Wheatland gate on Monday, activists had distributed fliers about the military Chaplain, Chris Antal, who recently resigned from the U.S. Army in opposition to the drone assassination program and the imperialistic policies of the U.S. In spite of high temperatures exceeding 100 degrees on Monday afternoon, numerous others joined our 2 day protest and encampment, even though they could not participate in the civil resistance the next day. Their support is much appreciated as we continue to wage our persistent voices against the cruelty of drone killing and endless wars. Our 2 day "vigiling" and messaging of signs along the roadways entering the base play an important role in stimulating critical thinking and challenging blind obedience. Our absence from this work could otherwise mean complicity. This work does not come without risks. On Tuesday, before the arrests, Flora Rogers and Michael right over the area they were standing, forcing them to quickly jump out of the way to avoid impact. This violent and intentional act was meant to intimidate us. As Flora and Michael were forced to jump out of the path of the huge vehicle, Flora sustained a foot injury that gave her swelling and pain, which, luckily, is getting better. This behavior will not stop us from returning, and it is not the first time. As Flora said: "It is our first amendment right and ours to protect. It is all the average citizens who speak out who protect the right to free speech! It it the artists and poets and songwriters! By ACTING we make free speech real and prove our existence and that our dissent is real!" Recently there has been some discussion and questioning of the value of the work we do while protesting at military bases. Those of us at Beale feel we have a huge ethical responsibility to be there. Besides, in doing so, we are "creating the change we want to see in the world." Every meaningful and respectful conversation had with a military personnel is bringing us one step closer to a more peaceful society. In last month's action a Beale airman who comes from a long line of military family members said he would find and listen to a couple of Howard Zinn speeches on Youtube. This might be the beginning of an opportunity for his 2-year-old son to have a different future than his own…tearing down a culture of war one human at a time. In recent years Occupy Beale activists have been increasing the frequency of civil resistance actions, and the U.S. military and U.S. prosecutors responses have been to detain, cite, release, but ultimately cancel the arraignment, without pressing charges. It appears they want to keep the covert drone program out of the public's radar. The drone program is rapidly expanding around the world, in spite of regular protests at drone bases across the country. Imagine if this unchecked computerized murdering occurred without a single military base protest? Would the military personnel assume they had the consent of the American public? There is rarely, if at all, any meaningful opposition in mainstream media. It is so important that they see and hear from us on a regular basis. What we do know is that the U.S. Air Force is having trouble keeping military personnel in the drone program. This was revealed in recent years by high level officials in the military who reported that drone pilots are dropping out faster than they are able to replace them. This is a small victory, but a victory nonetheless. Our persistence surely must be playing a role. We welcome others to join us when you can, and not be a part of the silent majority that perpetuates the status quo. In June, Kathy Kelly was among a delegation, listed in the Syria statement below, who had the opportunity to tour in Russia and to identify points of friction between the United States and Russia and what might be done to reduce the stress between the two countries. As her report suggests, the world would benefit from a great deal more person-to-person contact between Russians and U.S. citizens and education within the U.S. on political realities in Europe and Russia. After Kathy’s article is a statement issued by the delegation while in Russia aimed at discouraging an expanded U.S. assault on Syria, a statement that, sadly, remains extremely appropriate. In the historic port city of Yalta, located on the Crimean Peninsula, our delegation to Russia visited the site where Churchill, Roosevelt and Stalin, in February of 1945, concluded negotiations ending World War II. The Federation of American Scientists, in its 2016 inventory of nuclear forces, states that Russia and the U.S. own approximately 93 percent of all nuclear warheads. Each country has roughly 4,500-4,700 warheads in its military stockpiles. Konstatin, a veteran from the USSR war in Afghanistan, now a grandfather, spoke to us about Yalta’s history during World War II. “Many people perished here,” he said. “More than a million perished during WWII. This tourist resort was founded on the bones of people killed in the war.” An estimated 22 to 27 million Russians died during World War II. Konstatin urged all of us to find ways for avoiding further war, and he spoke about how funds spent on weapons are crucially needed to help heal children afflicted by disease or hunger. Julia, a University student who wants to become an interpreter working with diplomats, said that she is glad and grateful never to have lived through a war. “I always want to choose words instead of weapons,” she said. In 1954 the Soviet government transferred this largely Russian-speaking area from Russia to the Ukraine. In 2014, Ukraine's elected president was ousted and its new government formed in part by avowed neo-Nazis. Russia occupied the Crimea and after overwhelmingly winning an uncomfortably hasty vote, annexed or “reunited” the Crimean peninsula with Russia, depending on who describes the history. The Ukraine ouster is widely believed here and in much of the world outside the United States to have been engineered by the United States and NATO. What plays in the U.S. as Russian aggression is seen by many here as a response to antidemocratic NATO interference along the Russian border. It can be credibly argued that at its creation NATO’s mission was essentially defensive. Stalin was a terrifying dictator, suffering from increasing psychosis, with a long history of betraying even those who seemed to be his closest allies. Yet, as one Russian World War II veteran noted, the Russians had not tried to take over other countries far from their borders. They actually had been very cautious and conservative about extending the boundaries or reach of the Soviet empire by military force. After World War II, Russia needed to focus on rebuilding the internal Soviet economy and society. iii-the 2001 to the present decisions by the U.S. and NATO to invade Afghanistan and to establish long term military bases there, anchoring a military presence in the center of Central Asia. I hope Anton’s ideas will echo in the U.S. and help steer his generation toward pursuit of acutely needed new agreements. Kathy Kelly, peace activist, pacifist and author. She is a founding members of Voices in the Wilderness and is currently a co-coordinator of Voices for Creative Nonviolence. Kathy has traveled to Iraq 26 times, notably remaining in combat zones during the early days of the US-Iraq wars. Her recent work took her to Afghanistan and Gaza. Last December Jessica Reznicek beat with a sledge hammer on doors of the Northrup Grumman plant in Bellevue, NE near Offutt Air Force Base in protest of the company’s arms business. On May 25, Jessica was found guilty of misdemeanor charges, and the next day District Judge Patricia Lamberti Sarpy sentenced Jessica to pay $5,000 in fines and restitution for her destruction of property charge and was sentenced to 72 days in jail, time served, for her trespass charge. So as the situation stands, the people who got together and posted bond for Jessica are out $1,000. If you can help Jessica pay them back, she would really appreciate the help. Many of you are planning to attend events at the Democratic National Convention in Philadelphia, beginning with the climate change/environmental march on Sunday July 24. Below are flyers outlining the plans for anti-war/anti-drone war convention activities developed by a peace coalition that includes Philadelphia area and national groups. We obviously need as many people as possible to join in. We will have several drone replicas available, and the more people who come to our permanent outreach station at Arch Street United Methodist Church every morning at 10:30 am, at 55 N. Broad Street, in the heart of the downtown, the more replicas we will be about to "deploy". We will have plenty of flyers for people to hand out. We will be very grateful for any time you can give.